It's no accident that New Mexico is called the "Land of Enchantment." Sprawling deserts spotted with sage. Purple mountains wreathed with clouds. Adobe homes hidden on hillsides. Majestic pines. Endless artifacts. A cloverleaf of cultures from the conquistador to the Comanche to the cowboy. New Mexico enchants. A block south of the La Fonda Hotel in Santa Fe, on the corner of Wayer Street and old Santa Fe Trail, you will find Loretto Chapel. And as you step through its iron gate, you eneter more than a chapel courtyard. You enter another era. Pause for a moment under the sprawling branches of the ancient trees. Imagine what it was like when the Mexican carpenters completed the chapel in 1878. Can you see the settlers stomping through the muddy streets? Can you hear the donkeys braying? The wagon wheels groaning? And can you see the early morning sun spotlighting this gothic chapel - so simple, so splendid - as it sits against the backdrop of the desert hills? Loretto Chapel took five years to complete. Modeled after the Sainte-Chapelle in Paris, its delicate sanctuary conatins an altar, a rose window, and a choir loft. The choir loft is the reson for wonder. Were you to stand in the newly built chapel in 1878, you might see the Sisters of Loretto looking forlornly at the balcony. Everything else was complete: the doors had been hung, the pews had been placed, the floor had been laid. Everything was finished. Even the choir loft. Except for one thing. No Stairs! 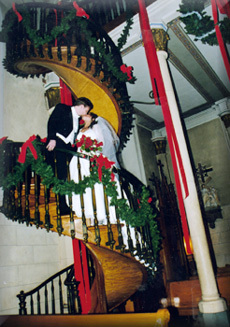 The chapel was too small to accommodate a conventional stairway. The best builders and designers in the region shook their heads when consulted. "Impossible," they murmurred. There simply wasn't enough room. A ladder would serve the purpose, but mar the ambiance. So what did they do? The only thing they could do. they ascended the mountain. Not the high mountains near Santa Fe. No, they climbed even higher. they climbed the same mountain that Jesus climbed 1,800 years earlier in Bethsaida. They climbed the mountain of prayer. As the story goes, the nuns prayed for nine days. On the last day of the novena, a Mexican carpenter with a beard and a win-burned face appeared at the convent. He explained that he had heard they needed a stairway to a chapel loft. He thought he could help. One morning the Sisters of Loretto entered the chapel to find their prayers had been answered. A masterpiece of carpentry spiraled from the floor to the loft. Two complete three-hundred-sixty-degree turns. Thirty-three steps held together with wooden pegs and no central support. The wood is said to be a variety of hard fir, one nonexistent in New Mexico! When the sisters turned to thank the craftman, he was gone. He was never seen again. He never asked for money. He never asked for praise. He was simple carpenter who did what no one else could do so singers could enter a choir loft and sing. 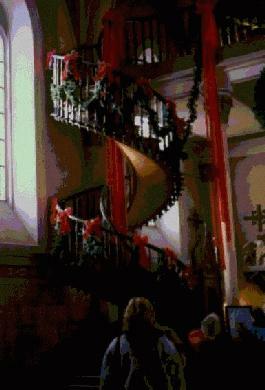 See the stairway for yourself, if you like. Journey into the the land of Enchantment. Step into this chapel of amazement and witness the fruit of prayer. Each year of his life is a step. Thirty-three paces. Each step of the stair is an answered prayer. He built it so you can climb it. And Sing!